Thursday, May 11, 6:00 p.m. In the 1930s, mobster Sam Termini called San Mateo County the most corrupt county in the state. With rumrunners landing Canadian whiskey on isolated beaches, moonshiners operating in homes and a multitude of speakeasies, the county earned a reputation as one of the “wettest” in the state during Prohibition. 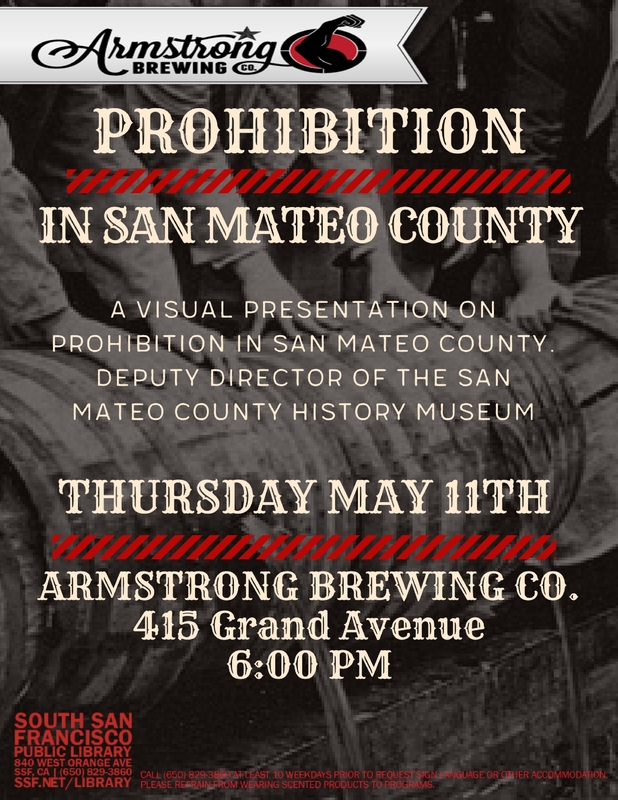 Carmen Blair, Deputy Director of the San Mateo County Historical Association, will share Prohibition stories during an illustrated presentation. Bio: Carmen Blair is the Deputy Director of the San Mateo County Historical Association. Her responsibilities include: being involved with school programs, public programs for adults and children, as well as overseeing exhibits and publications. She received her B.A. in History from Gustavus Adolphus College and her M.A. in Museum Studies from San Francisco State University. This event is co-sponsored by the Armstrong Brewing Company. Connect with Armstrong Brewing Co.